SUPER Cheesy Keto Spaghetti Squash, Never Miss Pasta Again! If you’re looking for the ultimate way to enjoy mac and cheese while sticking to low carb foods, then look no further than this SUPEEEEER cheesy keto spaghetti squash recipe! 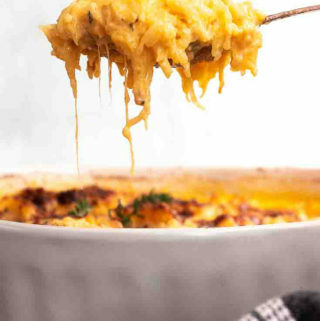 Growing up, mac and cheese was my jam — my favorite childhood meal, my go-to comfort food, and one of the first recipes I needed to perfect when going low carb. 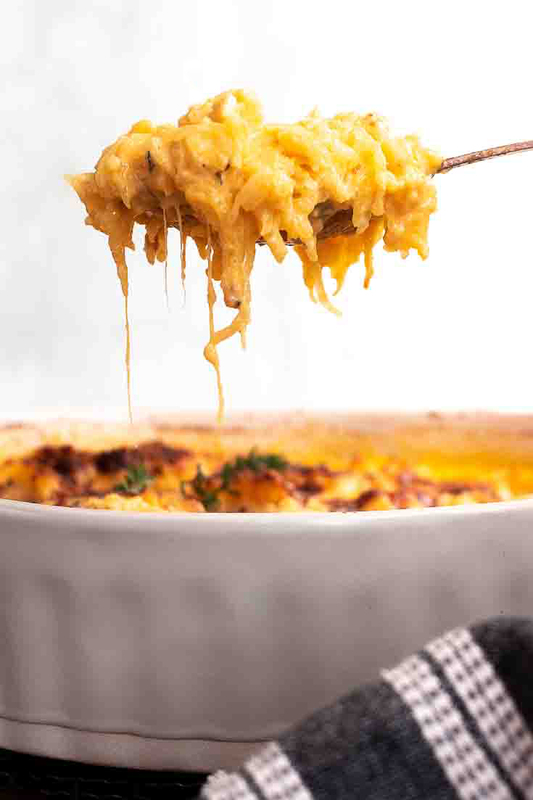 My family made mac and cheese a little differently than most people — we used my Mom’s famous mac and cheese sauce with angel hair pasta for noodles, which is why I opted to use keto spaghetti squash to make this version! Keto spaghetti squash is one of my favorite low carb vegetables because it can be turned into pasta!! I use it in all sorts of recipes as a noodle replacement, from this low carb mac and cheese to keto spaghetti squash soup. For those that are curious: one cup of spaghetti squash has 7 grams of carbs — but there are only 5.5 grams of spaghetti squash net carbs! This keto spaghetti squash is one of my favorite lazy-night low carb dinners. 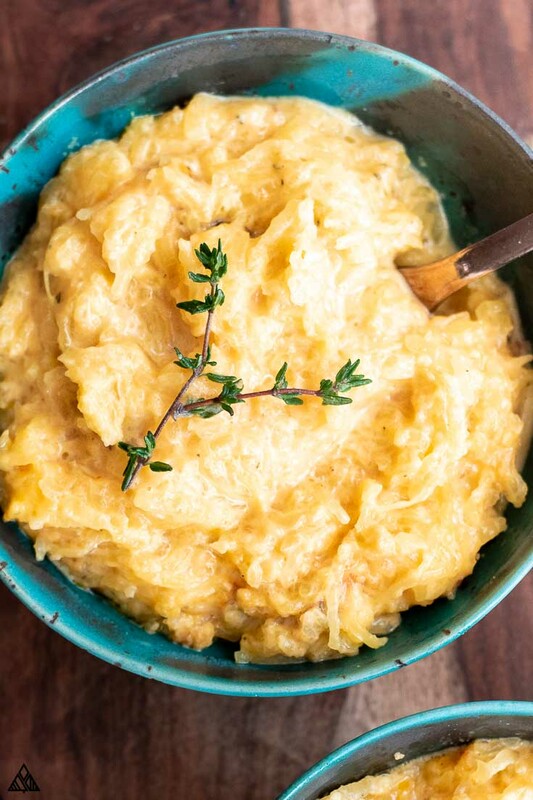 Pop on the Netflix and cozy up by the fire — you’ll only need to take a few 10 minute breaks to toss this keto spaghetti squash together! Place a damp paper towel under your cutting board, this will prevent it from sliding around as much. Pierce the keto spaghetti squash with the tip of your knife, then gently, CAREFULLY and slowly rock the knife back and forth to fully cut through the squash. This goes without say, but I’m always frazzled when cutting spaghetti squash, so thought I’d mention: NEVER place your fingers below or in the way of your blade. Now that bad boy’s ready to be scooped, oiled and thrown into the oven. You’ll know your keto spaghetti squash is done when you can use a fork to easily “scrape” the squash into low carb noodles. If the squash feels raw, toss it back into the until it’s easier to work with. I like to test the doneness of my keto spaghetti squash, then set it aside to cool while making the keto cheese sauce — otherwise you may burn your hands. This low carb spaghetti sauce is SO easy to throw together — it’s a melt and pour kind situation. The most important thing to do while making your sauce is to be sure it doesn’t burn on the bottom. Stir constantly, I find a whisk or a heat safe rubber spatula work best. Then, toss your keto spaghetti squash into the pot to thoroughly coat and combine everything into one of the happiest low carb casseroles your kitchen has ever seen! 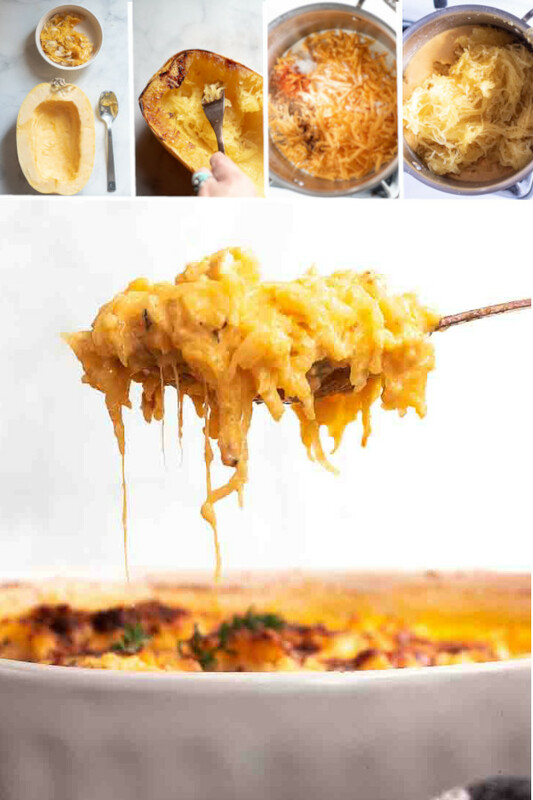 Pour the keto spaghetti squash and cheese sauce combo into a 9×13” casserole dish. Sprinkle the remaining shredded cheese on top (option to sprinkle crushed pork rinds for a breadcrumb-like topping), and toss that bad boy in the oven! Bake until the cheesy low carb squash casserole topping melts and everything looks delicious (about 20 minutes). This low carb spaghetti is the perfect dish for low carb meal prep. To do this, cook the keto spaghetti squash casserole per the instructions above. Allow it to cool in the fridge overnight. Then slice it into portions (this is easiest to do once the sauce has cooled and settled). Place each portion in a labeled resealable bag and into the freezer. This keto spaghetti squash mac and cheese can be made with any meltable cheese you have on hand, although I highly recommend Gruyere as it adds SO much flavor to our keto spaghetti sauce! Unsweetened, plain almond milk can be used instead of heavy cream. Alternatively, you can make keto spaghetti squash alfredo, keto spaghetti squash carbonara, or keto spaghetti squash and meatballs with a tasty red sauce. Just pour your favorite sauce over these noodles and you’ll be good to go! 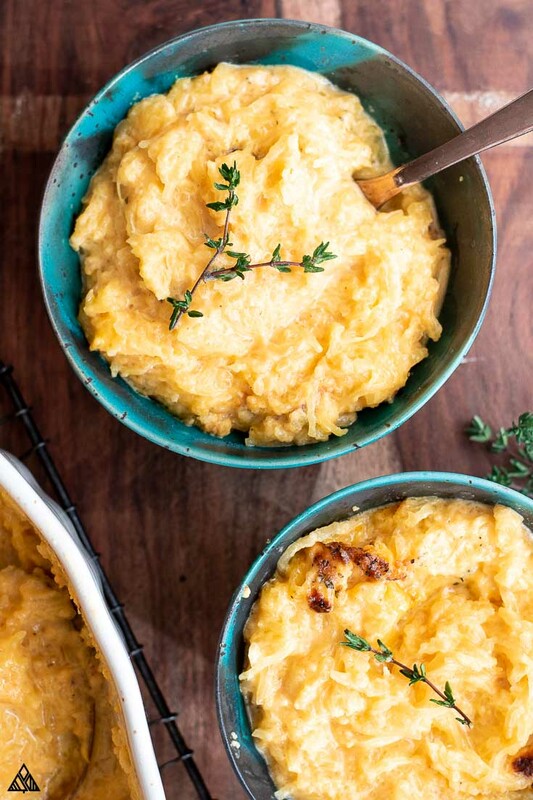 If, after trying this dish, you’ve decided keto spaghetti squash isn’t your favorite low carb pasta, there are plenty of alternatives to choose from. Zucchini Noodles, or any other type of veggie noodles. Zucchini is my favorite based on its carb count and flavor profile. 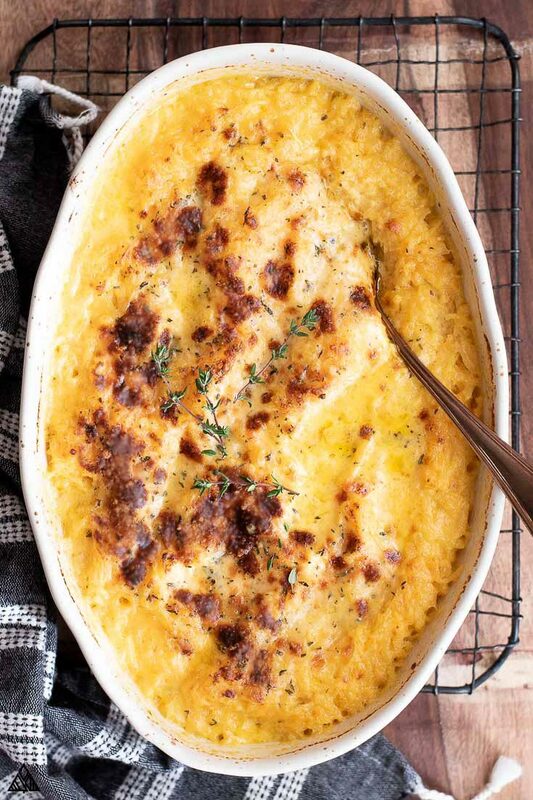 Cauliflower, turn this dish into cauliflower mac and cheese! Just roast the cauliflower before pouring your cheese sauce over it. Shirataki Noodles, have you tried these before? They’re not everyone’s favorite — but they’re carb count makes them worth mentioning. Give ‘em a try and let me know what you think! This low carb and keto spaghetti squash is the ultimate, cheesy and SUPER delicious comfort food casserole - one of those recipes that warms you from inside out! Carefully cut the spaghetti squash in half, lengthwise. I do this by inserting the tip of a sharp knife and carefully rocking the knife back and forth. Use a spoon to scrape the insides (wet strings and seeds) from the spaghetti squash (see photo for reference). Brush cut sides of the spaghetti squash with vegetable oil. Place spaghetti squash, cut side down, on a baking sheet and bake in the preheated for 35-45 minutes (cook time will vary depending on the size of your squash). You'll know your squash is done when a fork can easily scrape strings from your squash. If it seems raw, toss it back in. Lower the oven temp to 350 F.
In a small bowl, mix the cheeses and set aside. In a large saucepan, melt the butter on medium heat. Add cayenne, nutmeg, pepper and salt. Stir ingredients together to combine. Add the cream and stir everything together. Stir in the spaghetti squash, and evenly coat. Pour the keto spaghetti squash into a 9x13" casserole dish and top it with the remaining cheese. Cook spaghetti squash in the oven for 25 minutes, or until the cheese on the top starts to lightly brown around the edges. Cool slightly before serving, and enjoy! Add shredded rotisserie chicken for extra protein! Now it’s your turn! Hope you enjoy this keto spaghetti squash recipe as much as I do! Leave me a comment below and let me know how yours turned out. You didn’t list cream cheese in the ingredients. How much? Hope you enjoy and thanks for pointing out that type! I would like to verify that this recipe have cream cheese in it. The list of ingredients doesn’t list cream Cheese however the list of instructions mentions in step 0. Hi Debbie! Thanks for pointing out that cream cheese was listed in the recipe instructions! I tested the recipe with cream cheese initially and decided to thicken the sauce by adding more shredded cheese instead ( I promise it’s better this way!) Hope you enjoy! I know my wife would love this recipe! because she’s basically been obsessed with using squash in every recipe she makes lately haha thank you, great recipe!